Boaters anxious to get on the water after a long, cold winter are reminded to ensure their watercraft are Clean, Drained and Dry to prevent the spread of aquatic invasive species. Montana remains vigilante in stopping the spread of aquatic invasive species that can devastate aquatic habitats, ruin fishing and boating opportunities, and damage pipes and pumps used for agriculture and industry. Boaters who have used their watercraft in any water outside of Montana must have the boat inspected before launching. Snowbirds must seek out a watercraft inspection when returning to Montana for the summer, even if their boat has been inspected in another state. Many lakes and reservoirs in southern states are mussel-positive waters. Aquatic invasive species, such as quagga and zebra mussels, can survive on the hulls of watercraft during transport and microscopic mussel larvae can live undetected in standing water in boat bilges and ballast tanks. The risk of moving these invaders into Montana can be mitigated when boat owners are vigilant about ensuring their watercraft are cleaned, drained of all water and dry. Additionally, Montana law requires all watercraft travelling west across the Continental Divide into the Columbia River Basin to be inspected. And watercraft launching anywhere within the Flathead Basin that was last launched on waters outside of the Flathead Basin must be inspected. These heightened efforts to protect Montana’s waters are in response to the discovery three years ago of aquatic invasive mussel larvae in water samples from Tiber Reservoir. A sample from Canyon Ferry Reservoir also was found to be suspect for the mussel larvae. Just like in past years, watercraft owners must stop at any open inspection station they encounter. Inspection stations are starting to operate across the state. Boat owners can also contact any regional Fish, Wildlife & Parks office to schedule an inspection. To find a watercraft inspection station and to learn more, go to CleanDrainDryMT.com or call the FWP Aquatic Invasive Species Bureau at 406-444-2440. Do I need to be inspected? Confused about whether or not you need to get your watercraft inspected for aquatic invasive species? Don’t worry, the answer is simpler than you might think. Are you bringing your boat into Montana from out of state? Yes, you need to be inspected prior to launching. Are you crossing the Continental Divide into the Columbia River Basin? 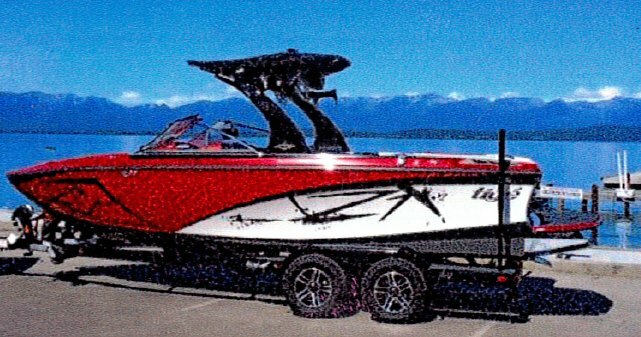 Are you launching on waters within the Flathead Basin and your watercraft was last used on waters outside the Flathead Basin? Are you encountering an open inspection station? Yes, if you have any type of watercraft with you, you must stop and get inspected. These rules are not just good ideas, they’re the law. The three steps of Clean, Drain, Dry greatly minimizes the risk of spreading aquatic invasive species. It also minimizes the time required for inspection at a station. Montana’s watercraft inspection stations are opening across the state for the 2019 boating season. Persons transporting motorized and non-motorized watercraft are required to stop for inspection as directed by signage. Anyone bringing a boat into Montana must seek out a watercraft inspection before launching. To better serve the boating public and improve efficiency, Montana Fish, Wildlife & Parks has made several changes to the program. Station operation hours have been extended, and some stations have been relocated or closed to better address AIS movement on watercraft. FWP is expanding partnerships with local groups to assist with inspection station operation this season, including the Blackfeet Nation, Confederated Salish and Kootenai Tribes, Missoula County, Garfield Conservation District and McCone Conservation District. 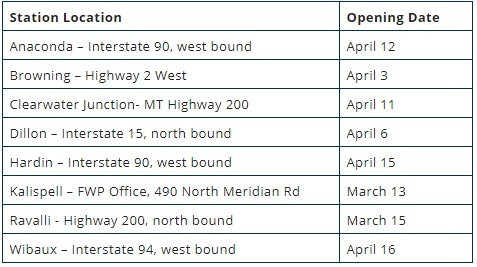 Inspection stations will continue opening through May at strategic locations throughout the state. To find a watercraft inspection station and to learn more, go to CleanDrainDryMT.com or call the FWP Aquatic Invasive Species Bureau at 406-444-2440.